Recently, I learned how to use automotive paint. I painted my scooter. I made a few technical mistakes on it, but nobody knows what they are except me and someone looking at it super-close. Here’s my scooter all pretty blue now instead of ugly grey. 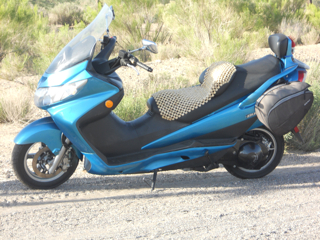 So I got to thinking…some of the details on my scoot I had brushed on and it brushed pretty smooth and nice. I wonder what else I can paint, but brush the paint on, or maybe a little airbrush (which I haven’t used in probably 15 years)? I thought about buying another scooter and painting that but that’s a pretty expensive thing to screw up if I didn’t do it just right, plus it’s a LOT of work for a first attempt at this. 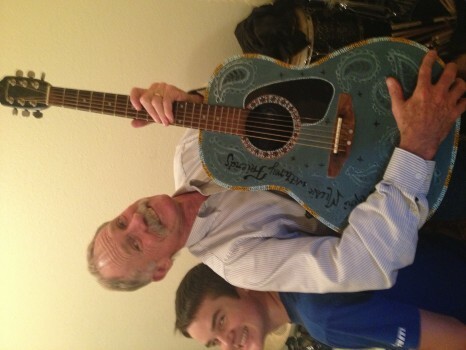 I recently bought a new, very nice guitar with some of the proceeds of my last major mural. Now my guitar is brand new and the wood is beautiful. No way could I improve on it’s natural beauty. So I started searching for the perfect guitar. My musically talented nephew Ben recently passed away and left his guitar. Nobody seemed to want it, but I was not able to get it before they yard saled it or something. Rats. That would have been perfect. I could have themed it to music he liked. Oh well. Later, I went to a barbecue with my BFF Jen at her brother-in-laws spread in Chino Valley. Clyde is a musician extrodinaire. Beautiful voice and can play the guitar like nobody’s business. He also teaches guitar here in Prescott which I will take advantage of later this month. We were sitting around the dinner table yakking about everything when I told him of my idea. He then went back into another room and brought me out this guitar that had a bunch of ugly cracks in the finish. He said his son uses it for campfire singing. I was asking him about what I could do to not affect the sound of the guitar. This one he told me, was designed by an aircraft engineer and the sides and back are made of some kind of resin stuff (black) which is what makes the guitar sound beautiful. The wood on top would not affected the sound if painted. PERFECT! Anyway, here is the “before” and the one of it all taped and ready to take off the old finish. So now I needed to be inspired with an idea. Hmmm, campfire…friends…camping…probably folk songs and country music mostly…belongs to a guy….HEY! I always loved that song by Willie Nelson “On the road again” MAKIN’ MUSIC WITH MY FRIENDS! That will be my theme. So Willie Nelson always wears bandanas and native american stuff. I jumped onto the internet to get some ideas and this collage of materials and some recent african beadwork murals I did is what is inspiring me. My plan (which can always change as I go along) is to do the main face of the guitar in a bandana-ish, probably blue background. I really like the color of the collage’s guitar. Around the opening make it look like beadwork with a simple design. I will research what the designs mean and try to do something significant. 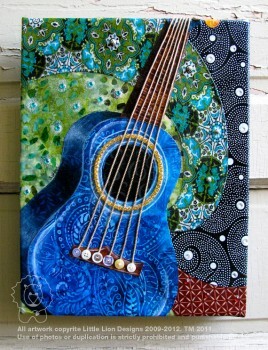 I may also put the “beadwork” around the edge of the guitar. 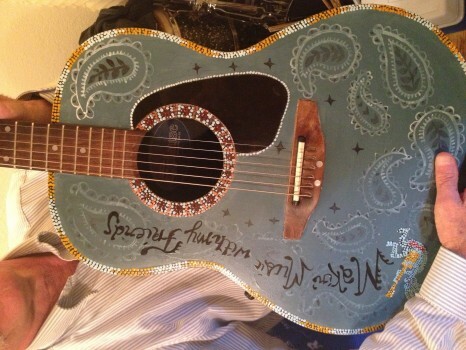 Then I want the phrase “makin’ music with my friends” written on the guitar somewhere. I may even incorporate it into the “beadwork”. We’ll see. I went to the automotive paint store to get some information (research, research, research. I love it!). I found out I can get the paint in 2 oz “touch up” paint size which is perfect. I already have primer left over from my scooter job. I’m going to strip the old finish with “strip-ease”, the stuff you strip furniture with and some sand paper left over from the scooter. I have an old air brush, but its one you have to hook up to a compressor, which I have, but the new ones just have a little can of propellent and the jars are a bigger than my old one. I may just splurge on a new one. I don’t even really HAVE to use an airbrush. I could just brush the whole thing…. The whole thing is brushed. I found though the stripping to be harder than I anticipated. The stripease did not work. I ended up using my mouse sander and a block sander with a lot of elbow grease to get the old varnish off. So here’s the finished guitar! You’ll have to turn your head on these images because I’m too lazy to go back to the computer and turn the pics. bleh. Hey, I’m an Artiste’, not a computer genius. While doing the bandana part, I found the automotive paint, especially if you don’t shake it too much to be translucent. I was able to paint the whole thing blue, then paint in white and black the paisley design. Parts of it were too bright, especially where I wanted the lettering to go so I glazed over the paisley with the thin blue and it worked like a charm! Oh and the lettering…I looked around for fonts in the traditional places and found nothing that was both whimsical and easy to read. But while out one day I noticed someone’s tattoo. Not the picture so much but the lettering. hmmm. So I went online and looked up tattoos and it’s lettering and found the best lettering! Some of this I made up, but I got the basic idea from some dude’s tattoo. 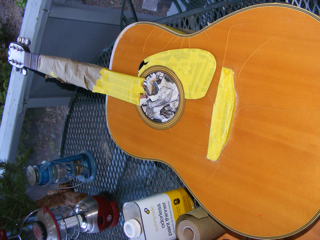 To finish the guitar, I left the “bandana” looking part without clearcoat. It has a matte finish. The “beadwork” and lettering however have a shiny automotive clearcoat on them to give them even more the look of glass beads. And here is the (in)famous Clyde Score, the famous musician who sings cowboy songs on the Grand Canyon train and also the Children’s train which runs out of Phoenix for Phoenix Children’s Hospital, the Burn Center and other children’s charities. He also sing a bunch of other places. But his love is music and kids! A gem of a guy! Thanks for trusting me with your guitar!